The phenomenon of homelessness is one of the worst forms of urban poverty and social vulnerability. No one wants to be homeless by choice. Women constitute one of the groups worst affected by homelessness. While the phenomenon of homelessness violates the most basic of human rights for all populations, women without a home and living on the streets suffer the most severe kinds of abuse and violence. The majority of homeless women are left to fend for themselves and they form one of the society’s most marginalized constituencies and the government should be urged to take urgent action to protect the human rights and prevent their further abuse and marginalization. Bai Khatoon lived in a village near Talagan not too far away from Rawalpindi. Customarily she was married off at the age of fourteen . She bears the stigma of being genetically challenged, was soon abandoned by her spouse. Strong she must have been to have exercised her decision power to move to the city to fend for herself. She was in search of employment but due to her disability, she was at a disadvantage in finding a job as a domestic worker in people’s homes. Her recourse to support herself was to beg in the lanes of the city. She was homeless without the basic shelter over her head, not even a kuccha (unfinished slum or shanty house). She was able to join the homeless community of a slum area outside the city built by slum lords who have made vast profits from building slums on contested land and using the notoriously corrupt police to protect their investments and exploit the poor dwellers. She has been living there for the past six years. She lived in a shack that could barely keep the sun and rain away but was in close proximity of the city were the opportunities are. She ended up in drifting in urban slums and became part of a floating population. She was comfortable in begging as she stated she begs every three days and would go back when her earnings are spent. Her needs were basic. She claimed that her existence was on a day to day basis. By leaving on her own she seemed to have developed her own mechanism of defense. She lived amidst the homeless community by choice. Being part of the community she felt it appropriate to intervene in a fight between two males to pacify them. Little did she realize that she would come out a victim as she had her right wrist fractured by a blow with a stick. What was perceived in this single woman was her resilience, her determination to struggle and to be helped and ultimately cured in spite of the social ostracism attached to a beggar and a homeless. She had demonstrated courage, confidence and seemed uninhibited by her disability and the social stigma. On a follow-up visit the next day we found out that she was being operated on. There was not much of an investment of financial assistance in her case but the impact was great morally and physically. It is again a situation when the intervention of Heartfile, the manner in which the process expedited the approval and surgical intervention is remarkable. Lack of an adequate housing had made her more vulnerable to violence. 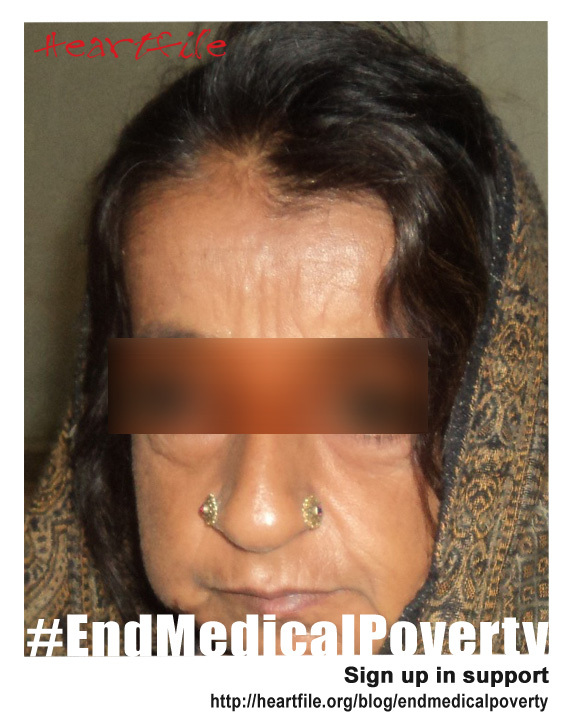 She initially had suffered from forced eviction and became homeless. She asserted persistent poverty and abandonment by her husband resulting into her being thrown out of the home and on to the streets. A woman without family is among the most vulnerable but a homeless woman is ten times more vulnerable than a man.